Fresh Vegetables with garlic and olive oil and a splash of Marsala. Perfect over cooked rice or pasta. 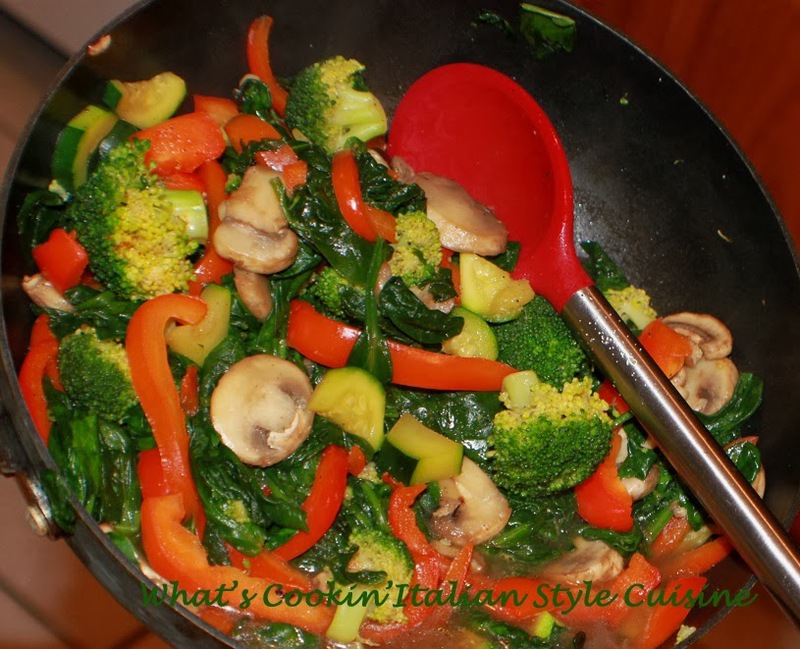 Just remember to keep it the healthiest, eat this without carbs and add as much of the vegetables you like in this pan. Optional to serve with: cooked rice, boiled penne pasta or over hard crusted Italian bread. Optional meat: Add 1 cup of either cooked Italian sausage, cubed cooked chicken or sliced cooked steak. Other vegetable suggestions: green beans, carrots, artichoke hearts, onions, tomatoes, shredded cabbage and other greens you like. In a large non stick fry pan, not heated, add the oil, garlic and wet spinach, saute add red pepper flakes until wilted. Once wilted, add all the cut up vegetables and saute for around 6 to 7 minutes (unless you like them very soft, then continue to saute to your likeness.) Add a little more olive oil if it started to get too dry. Options: Drizzle with 2 tablespoons of Marsala. Stir to blend. Serve over Italian rice. Top with grated romano cheese.